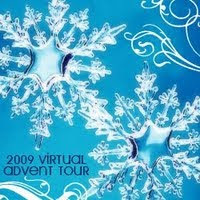 Today, I'm writing a post for the Virtual Advent Tour hosted by Marg and Kailana. I have never participated in the Virtual Advent Tour before, mainly because I don't celebrate any holidays at this time of the year. But that shouldn't stop me, right? So here I am. I spent some time mulling over what to write for this post. We don't have many traditions centered around Christmas (or Hannukah or Kwanzaa) in my family. If we have anything approaching a tradition for this time of year, it's traveling. Last year, my family spent the holiday season in Thailand & Cambodia. We've also rung in the new year in Cairo, Bangalore, Phoenix and the Carribbean. This year, we may be spending Christmas in New Orleans, but we haven't made the decision quite yet. I've always enjoyed our family travel, though I know a lot of people can't handle that much family in confined spaces for that long. I can see that- it is difficult to spend that much time with the only people in the world you feel completely comfortable fighting with and blowing up at! And I bet, if any of us kids were married, the way our parents so very badly want us to be, that the trips would probably end. But for several years now, we've been going strong with them, and it's been good times. My favorite new year abroad (I think we were traveling on Christmas to get there) was definitely Thailand last year. It was truly magical. We were in Lampang. Much of the tour group, about twenty people or so, decided to go to a late dinner at a local restaurant and ring in the new year there. We had really yummy food and drinks, and just a very nice time chatting and enjoying everyone's company. It's funny when you travel with people you didn't know previously- you bond so quickly and get along so well while you're together, but when the trip is over, you say goodbye, return to your separate lives and often don't talk much again. But while the friendship and the trip last- so much fun! Our dinner ended right around midnight last year (though we weren't quite sure as everyone's watches and all the TV stations seemed to have a different concept of when the new year began). Looking out over the river the open-air restaurant was situated on, we could see so many fireworks lighting up the sky. And other things, too, that looked like shooting stars. But there were so many shooting stars that we began to wonder what the things really were. Our waiter told us that they were paper lanterns; the Thai write their names and wishes for the next year on these foot-long white paper lanterns, then attach them to a sort of hot-air balloon device before setting them free and watching them lift off into the air. It was such a beautiful tradition, one that I was completely unaware of. And just so magical to see. I have pictures here to share with you, but as my camera doesn't do well in the dark, I don't think they do justice to how absolutely breath-taking the whole experience was. And, so you can get a sense of just how many lanterns there were, and how gorgeous the entire experience was, here are some professional pictures I found on Google for you! They're not from Lampang, but are taken from a lantern festival held for New Year's in Thailand. But it was similarly beautiful where I was, too. Thanks for including me in the Virtual Advent tour, Marg & Kelly, and thank you to everyone stopping by! I really enjoyed reminiscing about my trip; here's hoping that 2010 comes in a similarly lovely fashion. For today's other stops on the blog tour, check out Maree, Lisa & Robin! I've used these! They are spectacular. The pictures on Amazon, do not do them justice. Not like yours do! There's something magical about all those lights in the middle of a dark winter night! What an interesting post! This is such a lovely post, how beautiful! I love that your family travels over the holidays, too. What a neat way to spend time. My family does travel together still sometimes, even though I'm married now -- my husband was just absorbed, amoeba-like, whether he wanted to be or not ;) Although it is true, we don't travel together nearly as much as we used to. I have now decided I must make it to Thailand for the new year sometime, though. I hope you enjoy your trip this year, no matter where you go. That is incredible. What a beautiful site and to tell you the truth that is what the holidays are about, finding beauty in mankind. Happy Holidays and Happy Traveling. That looks breathtaking. What a wonderful thing to be a part of. That's so beautiful! I've seen those type of lanterns around the Fourth of July, but what a lovely tradition for New Years! Wow. What a fantastic post. The lantern wishes tradition is just beautiful. Aren't people breathtaking, in all the glorious ways they devise to celebrate life? 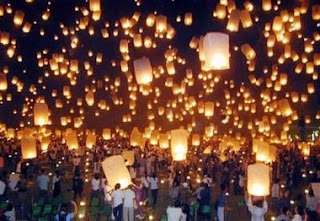 What a wonderful tradition...both the lanterns and the travel! The lanterns are beautiful, thanks for sharing! How very wonderful your family trips sound. You are all very lucky. The Thailand adventure is amazing. Wow, those lanterns are gorgeous! Do they eventually burn up? I bet Christmas in New Orleans could be a lot of fun too. I literally gasped aloud when I got to those two final shots. No wonder you were so blown away by the scene! Thank you for sharing such a unique custom -- and your own tradition of travel -- with us. I love travel traditions! I try to go somewhere every year for my birthday, and in the past years, I only missed once (2008 - because we had just gotten Emmy!). I'm glad you all liked the post! I was really pretty nervous at first, as it has nothing to do with baking, knitting or the other things everyone seems to be posting. I am glad that the post still qualifies for the Virtual Advent tour! It really was a gorgeous sight and while there weren't *quite* that many lanterns where I was, the magic was no less. Rhapsody - I agree that NYE in New Orleans would probably be lots of fun. I would probably go there for Jazz Fest over that, though. Chris- That would be wonderful to meet! I'll let you know my plans once they're figured out. 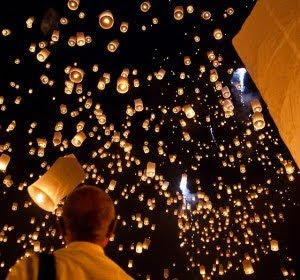 I remember having a book about the paper lanterns when I was little, and the celebration with them. I wouldn't mind traveling being a tradition! Thanks for joining in. :) Happy Holidays! I'm so jealous-I wish we could travel as a family unit as adults! But since my sister's engaged and has a three-year-old, I don't see that EVER happening, lol. Her fiancee hasn't travelled much at all, so she insists on bringing him everywhere with her. Wow - that sounds really nice. My husband and I are thinking about traveling next year for Christmas (he's thinking Carribean Cruise!). Oh my gosh, those pictures are astounding! I love them! Aarti, thanks so much for joining in. I know you were worried about it, but really, we want the tour to be accessible to everyone, regardless of background or religion or whatever! I love the idea of going away somewhere. Not sure my family members would be all that pleased, but the idea sounds fabulous to me. You are right, just because you don't necessarily celebrate the holidays doesn't mean you shouldn't write about it. I am glad you did. I think it's a wonderful thing that you can travel with your family to so many awesome places. I can't imagine how beautiful the lanterns lighting up the sky like shooting stars were, breath-taking and magical, I'm sure! The photos you posted are so pretty! I think it's awesome that you have traveled and observed how the holidays are celebrated in different countries & cultures. That's an invaluable experience. You may not actually celebrate a specific holiday in your family but it sounds like you've experienced some wonderful celebrations! Beautiful photography and what a nice post! Great post! I've never been to Thailand myself, but have several friends who go there each year over the holidays in December. The pics of the lanterns are really amazing. Thanks for sharing and a great December to you - and I am rather envious of you end up going to New Orleans, its one of my favorite places, but I've only been once. Unfortunately, my better half wasn't as enchanted as I, and I have since tried to convince him to go again, but still no luck. I loved it there. That is so cool! I love the idea and the photos are gorgeous!! Thanks! Traveling for the holidays sounds like such a great tradition, and I can imagine it is very exciting when it gets closer to the holidays and you know there is a big trip coming up. I also loved the paper lantern pictures, totally gorgeous! I meant to comment when you wrote this post and time got away. Several years ago I drove around Thailand and remember visiting Lampang. I ate an open air restaurant on the river too (maybe the same one?). One of my favorite places we visited was Mae Hong Son in the North. Driving around Thailand helped us to connect with the locals. We started on a tour, then ditched it after several days of tourist stops, rented a car and had a wonderful trip. Great pics by the way! Thanks for bringing back memories. I want to go again!